Harvest Essentials Exclusive Excalibur 9 Tray Dehydrator 3926T Timer Model in a White on White color! 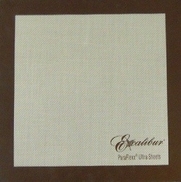 Enjoy a white door with your white dehydrator - not even available from Excalibur directly. White on white simply looks better on your counter than any other color. Black model includes black door. This Excalibur food dehydrator with timer is a useful addition to a kitchen. Its beautiful design in white lends it elegance and function. With the Excalibur 9 tray dehydrator, you can easily dehydrate a variety of your favorite fruits and vegetables and still get all the benefits associated with food dehydration. The Excalibur 3926T dehydrator is a modern way to food dehydration, which brings a lot of value to your food. 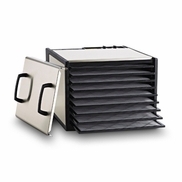 It is simple to use, and what makes this tray so much useful and unique is: it uses Turbo Charged Parallexx Drying System, which completely eliminates any kind of contamination, which was common in the past, during the long process of dehydration. The Excalibur 9 tray dehydrator offers you advanced dehydration solutions by offering everything you require to achieve perfection, and hence, making your dehydration process all the more easy and smooth. This Excalibur food dehydrator has a tough and durable polycarbonate construction, which makes it almost unbreakable and washable with dishwasher. 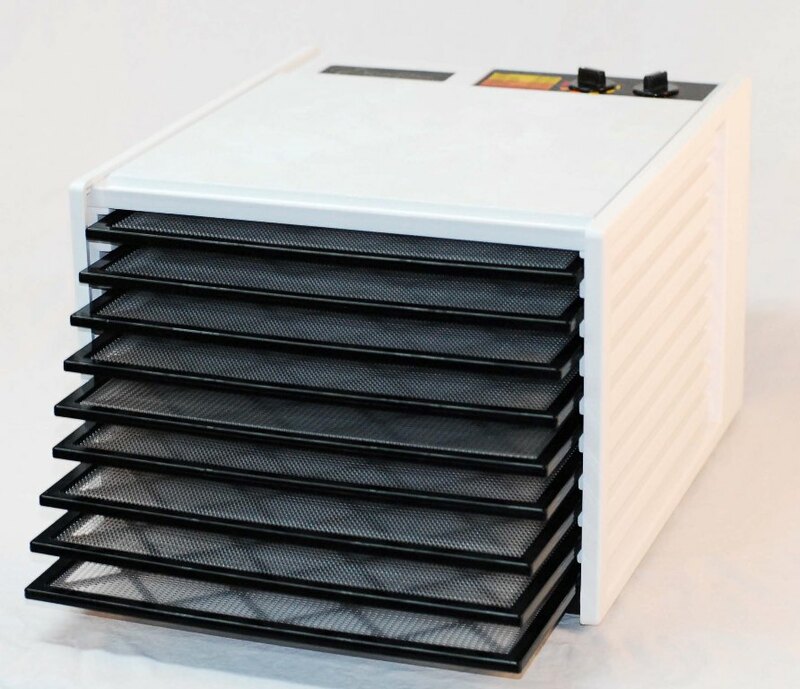 Includes adjustable Thermostat, a heavy-duty fan and all the electronic controls provided at the bottom of the dehydrator, ensures its 26 hours of uninterrupted operations. You can set the timer for twenty-six hours and the process will terminate automatically as per the time you�ve selected. 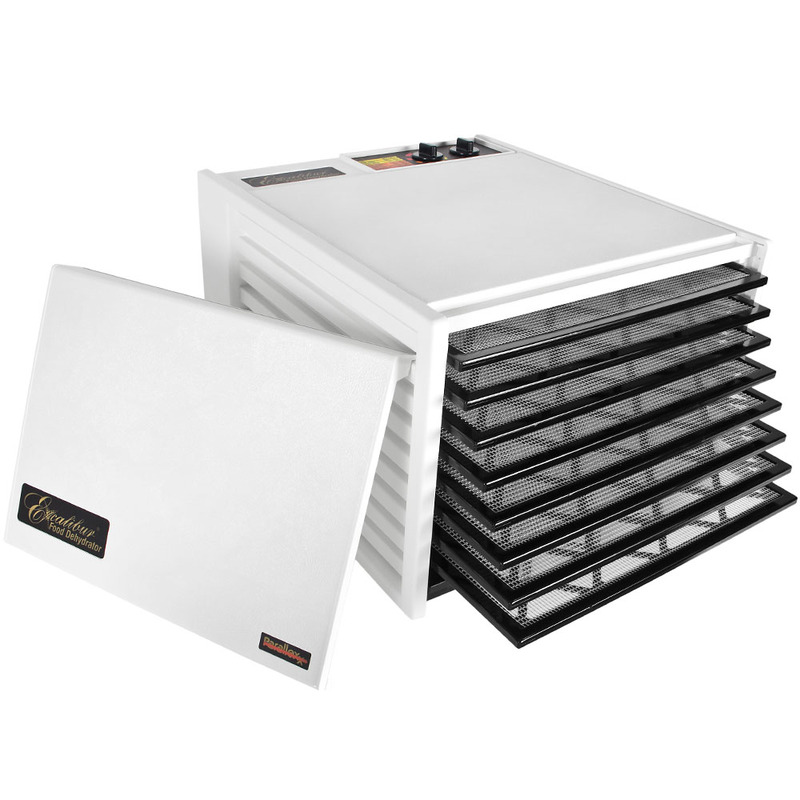 This Excalibur food dehydrator is easy to maintain and food can be preserved safely for many hours. No need to rotate the tray as the drying can be done instantly. 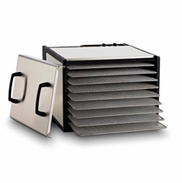 Horizontal airflow facilitates maximum dehydrating efficiency. The dehydrator was shipped fast. Got it and put it to work right away making some halibut jerky. It couldn't have worked any better or easier. Can't wait to keep using this thing and getting better and better at it. For over 35 years I have used one of the old round style dehydrators that you had to keep rotating the trays and check on constantly. WELL NO MORE!!! I love my Excalibur 9 Tray I unpacked it 4 days ago and it has been running pretty much non stop and plan to keep it that way to. The only reason I am not giving it 5 stars is it will sometimes seem to vibrate like maybe the fan speeds up or something. Then it is a bit noisy. But WHAT I LOVE is load it up set the temp and the timer and don't worry about it until it shuts off. I highly recommend the Excalibur to anyone that wants to dehydrate their food! I have never done this before, and friends told me not to buy this because I could just use my oven. No way was I going to run my oven for hours. So I bought this machine and I am so pleased on how this works. I showed this to the ones that suggested the oven, and they are jealous. They want one to. I have made fruit Christmas gifts for my family, and this will help me to eat more fruit. Great purchase ever. I bought this dehydrator because this is not the first one I have owned. I bought the first one over 33 years ago and it served me well all that time. The motor finally quit and I was in the middle of drying the fall harvest, so I went on line and of the many distributors offering this product, Harvest Essentials had the best price. I received the product in 2 days which was more than I had expected. It was well packaged and I cannot say enough for the promptness in the way it was handled. If there were more stars available you would get them. Great in all categories. I am just blown away! I always thought dehydrators were just for jerky or apple slices and I don't much care for either. I started reading and studying and learned about dehydration. Bought a cheap model to start and was blown away by results. When I got the 9 tray Excalibur, well, magic happened. There is absolutely NO reason to waste another thing. Ever. Just dry it out and add it to eggs/soup/ whatever you're cooking. No more additives and artificial ingredients for ME! With the Excalibur, it's going to be all natural and organic from this point on!!!!! Grateful, Thankful, and Blessed! Love this product! Use one for myself and second one bought for The Center for Children and Young Adults to help preserve some of the food we grow in the garden for their kitchen. Great product!! Purchased this as a wedding present for our nephew and fiance. Quick delivery. We purchased the model 3926 TB last year and have really enjoyed it. When our nephew and fiance set their wedding date they also indicated their wish list for wedding presents. We did not have to think twice about what dehydrator we were going to purchase. I know they will enjoy it. I love my new dehydrator! fast shipping, easy order. Love the unit, but had to pay extra for the clear door. Good thing Walmart had it for $20. The book it comes with is not very good. I have owned just about every dehydrator out there. The Excalibur Dehydrator is the best! I am totally amazed at how quickly and how well everything I have tried has turned out. Can't wait for summer's bounty! Wonderful machine. Easy to use & clean. I should of invested in the clear door. 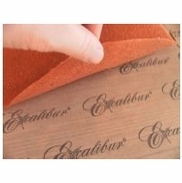 I have used my parents Excalibur dehydrator and it had been great. Just got Just got my own delivered I ordered from harvest essentials and can't wait to put it to work. I've used this for several years, but it had to be replaced at no fault of the machine itself and I bought the same unit. Love using it to dehydrate all kinds of fruits and to make beef jerky. Had several round ones and had to rotate trays to get proper drying.With this dehydrator you load and your done. Does a great job. Love ,love. Have had it in use every day since it arrived. Jerky first, then fruit, followed by vegetables x 2 days.Cleans easily, actually doesn't even make a mess. This is the best dehydrator I've ever seen! It doesn't take up much space, but the nine shelves hold a lot. I love to make beef jerky and can't wait to start trying different recipes. I would definitely recommend this dehydrator. This is a excellent dehydrator! I borrowed the exact same model from a friend so I knew exactly what I was getting. It is a real Workhorse. Have used the dehydrator several times so far. Works great. already at work drying my crop of apples. This is the second one I have owned. I bought one in 1981. I finally wore it out this last year. Excellent product. Easy to use, good instruction book. Love it. Works great, very even drying and holds a ton of meat for jerky. So easy to clean as well, worth the money just for that reason. My new Excalibur 3926TW makes dehydrating more of a pleasure then a chore....I wish I owned one years ago......Dehydrating with a timer is the only way to go! I am so thrilled with my new Excalibur dehydrator! It was on its way to my house the day I placed my order. I fired it up with some juicy plums and it did a wonderful job. I am so glad I paid a little extra and got the timer option. I've had great success with everything I've dried so far. So far I love it! I've only had it a week and have used it to dehydrate apples. It did everything that I hoped it would. I'm looking forward to drying vegetables next. Very Fast Shipping, excellent packaging, on a great piece of equipment that will help stretch our food budget with home dried foods that we control what is added to them. Great Buy from a Great Store, Very happy with the whole experience. did exactly what I got it for, easy to clean. will be using it a lot with garden and berry season starting. Been very satisfied with the dehydrator. Have made jerky, dried peaches, and oranges all with very good and consistent results. Used a thermometer the first couple of times and it was always right on. The trays are very easy to clean and so far i cannot find anything negative to say. I did receive a slightly damaged unit that was likely dropped during shipping as one corner was broken. Contacted harvest essentials and they very quickly sent out replacement parts. Best dehydrator by far on the market would recommend to every one. We have had our first dehydrator for over 10 years and love it. My husband has started making beef jerky in a few flavors and has such a nice little business that we needed to purchase a second one and chose to buy the exact same one. We are very happy and it has made life great. Love this machine! Dehydrated 20# of peaches - it works great!! Have not had opportunity to use as often as I had hoped to. Will have more time in near future. A great dehydrator at a great price. Started with dehydrating our over abundance of strawberries which will be great for backpacking and adding to cereals and baked good. We will continue with fruit leathers and any surplus from the orchard. 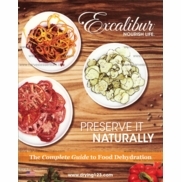 I already own one Excalibur Dehydrator with 5 trays. Have tried other dehydrators in the past, was not satisfied with them at all. Needed more space for dehydrating and would not purchase any other brand. Excalibur is the top of the line as far as I'm concerned. 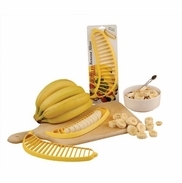 Easy to use and easy clean-up, excellent design and even drying with no fuss. I would recommend this to anybody interested in dehydrating. I use mine mainly for beef jerky. I am thrilled with my Excalibur Dehytrator. I was able to yield large amount of dried fruit and vegetables with it this past summer/fall. It has 9 trays, so it has a large capacity. This was especially helpful when I dehydrated apples and peaches. I like that it has a timer on it, and will shut off if it was on while was sleeping. The silicone sheets are very easy to wipe down and clean. I would highly recommend this product. 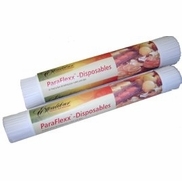 Even though it's pricier than other brands, it is higher quality and dehydrates the food evenly. We ordered this in the fall 2014 and tried to work it to death, it is still going strong. I would highly recommend this one to anyone serious about putting up food. Excalibur Dehydrator - Great Product! Excalibur dehydrator is quiet, works great, and holds a ton of food. Trays clean up easily. I are very pleased with our new dehydrator. It came just as promised and is super easy to operate. I was going to get a less expensive model but am very happy that I didn\'t. Now I am even thinking to buy the trays to make fruit roll ups, etc which i initially thought I would never do. My husband was recently diagnosed with a rare form of dementia. Mayo Clinic told me I needed to get him a hobby. Since he does like to cook my choice was to start him dehydrating which is easy and very useful. I was disappointed that my purchase didn't include the Dehydrator Guide book and discount on the other trays but was very happy with the discount and free shipping! I would definitely recommend you again! MY best dehydrator so far. It has been a pleasure dealing with Harvest Essentials. I have used this dehydrator a lot since I purchased it. I have been very pleased with it. I love the timer and temperature control. The food comes easily off the screens. I can do a large amount of food at once because it holds a lot. I always recommend it to friends.